Plans for pilot road-pricing schemes should not be seen as an automatic step towards a national strategy, Downing Street has said. But the prime minister's official spokesman insisted doing nothing to tackle congestion was not an option. An e-mail from the prime minister is due to be sent to the 1.7m people who signed a petition opposing the plans. A BBC-commissioned poll found nearly 75% of people are opposed to the idea of charging motorists by the mile. Tony Blair has said he will respond by email to everyone who signed the petition on the Downing Street website once it closes at midnight on Wednesday 21 February. It is expected that his response will be posted on the site at 0600 GMT on Wednesday. 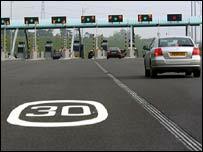 His spokesman said the government would press ahead with 10 road pricing pilot schemes in 10 locations around the country. "We are going to carry out ten pilot schemes," he said. "The discussions about those are ongoing. "The important thing to stress is that the pilot schemes are to work out what is possible in tackling congestion, how to go about it and how to learn lessons. "This is not just one step towards a national road pricing scheme." He added that congestion was predicted to rise by 40% by 2025. "What we can't do is do nothing. Doing nothing is not an option," he said. Plans to introduce a nationwide "pay-as-you-drive" system were unveiled by former Transport Secretary Alistair Darling in 2005. Mr Darling's successor, Douglas Alexander, has since suggested that road pricing could be brought in within a decade. The spokesman's comments came as the results of a BBC-commissioned poll were revealed in which 74% of people said they were opposed to charging motorists by the mile. But 55% of those spoken to said they would change their minds and support such a scheme if the money raised was used to improve public transport. More than 25% said nothing would make the policy acceptable to them. Those most in favour of a charging system were 18 to 24-year-olds with 28% of those asked saying the government should introduce one. The petition says tolls are "sinister and wrong" and unfair to poorer people. It calls for the scrapping of "planned vehicle tracking and road-pricing policy". It appears on a new section of Downing Street's website, which was set up in November to allow anyone to address and deliver a petition directly to the prime minister. The petition was so popular that at one point it crashed the prime minister's website. The man who started the petition, Peter Roberts, a 46-year-old account manager from Telford, said the poll was more evidence that people were wary of road charges. He also said investment should be made in the transport network without a road charging scheme. "Road pricing as an idea has got some merit," he said. "But the cost of the technology and the infrastructure would be far better spent on improving the railways and the public transport system". Which if any, of the following, would make the policy acceptable to you?